All the cathodes are connected together and the common cathode point is available at pins 3 and 8. The anodes are driven through a microcontroller’s I/O pins with current limiting resistors in series. 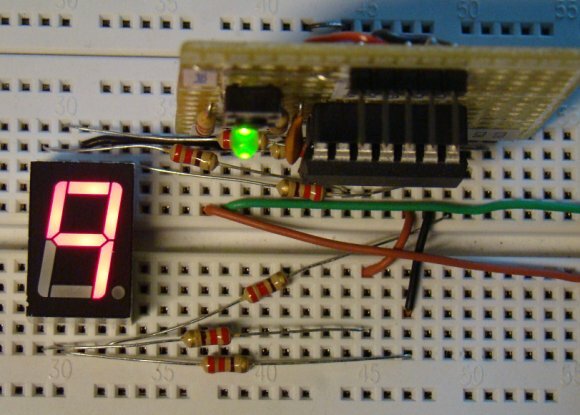 Displaying a number requires turning on and off the proper segment LEDs. For example, to display a number 7, only segments a, b, and c should be turned on. 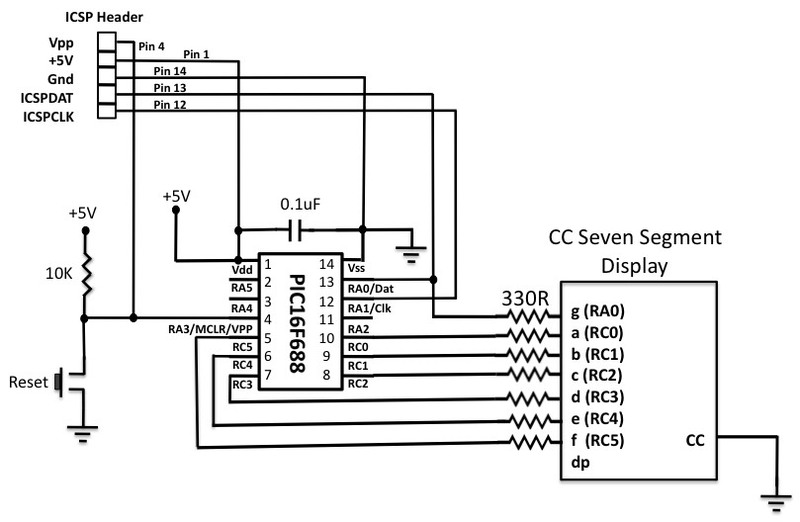 The circuit diagram for connecting a common cathode seven segment LED display to the PIC16F688 microcontroller port is shown below. 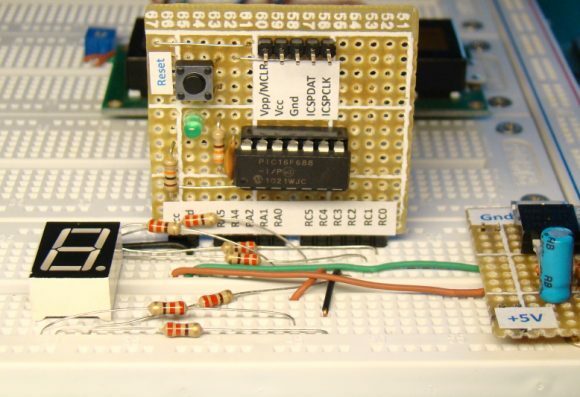 The microcontroller I/O pins source the current required for the segment LEDs. 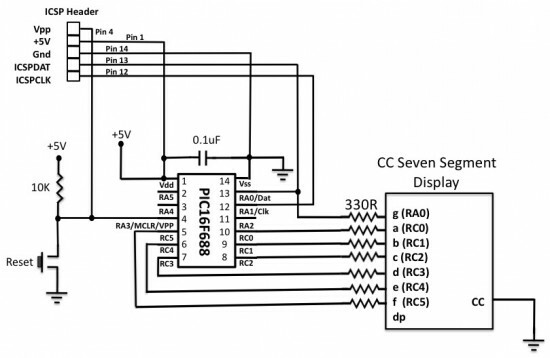 The current limiting resistors connected in series between the microcontroller pina and segment LEDs are 330 ? each. Segments a-f are driven through RC0-RC5, and the segment g is driven by RA2. The decimal point is not used. Please check the manufacturer’s datasheet to identify the segment pins of your seven segment display module. The segment LEDs are driven through PORTC and PORTA, so they are defined as digital outputs. Any comparator functions in these pins must be disabled too. The program counts from 0 through 15, with 1 sec interval, and rolls over to 0 again. The count values are shown on the seven segment display as 0, 1, 2, 3, 4, 5, 6, 7, 8, 9, A, B, C, D, E, and F. Compile the following program with the MikroC Pro for PIC compiler from MikroElektronika and load the HEX file into the PIC16F688 microcontroller. 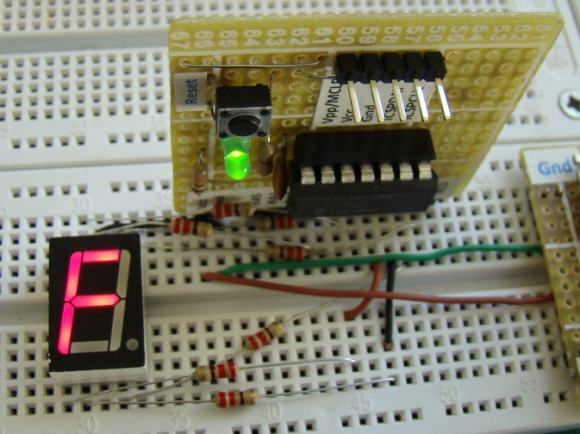 Read the first lab session, Lab 1: Flashing an LED, for the clock and configuration bit settings of the microcontroller. 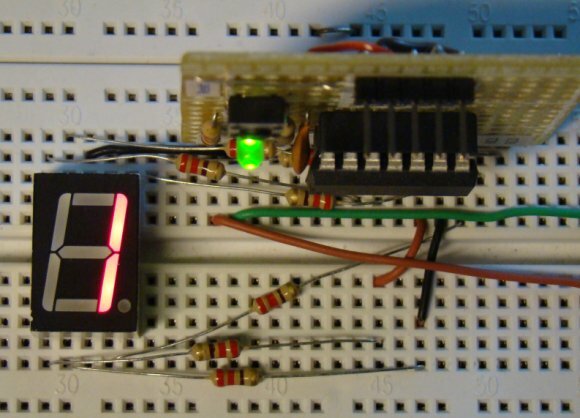 After the program is loaded into the microcontroller, turn the power on and see the hex counter counting from 0 to F.
Great article! I noticed a small discrepancy between the circuit diagram and the code. 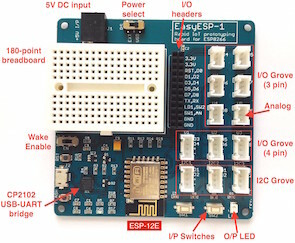 Your circuit and the description say segment g is driven by RA2. However the code and the provided Hex file actually use RA0. Thanks for all the information on this site! Looking forward to the discussion on multiplexing. You are right, Matt. I have corrected it in the circuit diagram. Thank you. Instead of using a very long case statement, it is much simpler to use an array.